Pink Lemon Twist: Mystery Stole 4 - Sign Ups Are Open Until September 12, 2008! Mystery Stole 4 - Sign Ups Are Open Until September 12, 2008! What time of year is it? IT'S MYSTERY STOLE TIME!!!! Mystery Stole 4 is now open for sign ups! Yarn! Beads! Lace! Oh Happy, Happy Day! Never done Mystery Stole before? Don't have a clue what I'm talking about? Well pull up a chair and I'll tell you about it. This year's Mystery Stole Knit Along has been designed and will be hosted by my mother, Georgina Bow! 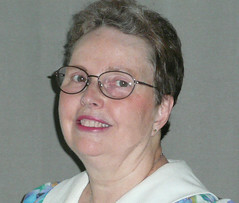 She lives in the state of Colorado and has been knitting for over 40 years. She has written several patterns including three stoles, and has more patterns in the works! To see examples of her designs, please see Georgina Bow Creations Patterns or check her out in Ravelry - her Ravelry ID is GeorginaBow! But wait, that's not all that's new! This year, due to popular request by our participants, we have a brand spanking new Mystery Stole 4 Store! We've got mugs, totes, and more - oh, my! The best part is, all proceeds from this store will go to Genesis Women's Shelter, the Official Charitable Cause for Mystery Stole! The group opens today, August 1, 2008 for sign ups. There will be 6 clues total, posted once a week on Friday mornings, with the final clue going out on October 10, 2008. On September 12, 2008 at midnight Mountain Daylight Time, the group will close to new members. 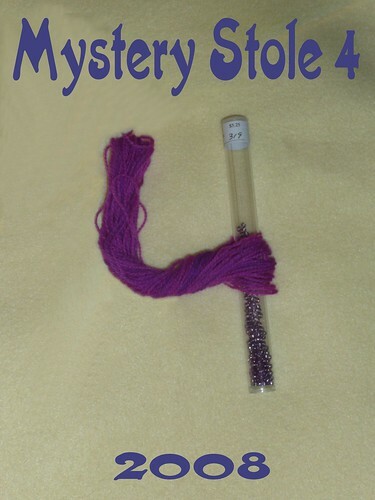 So if you're ready to sign up for Mystery Stole 4, follow this link to our Yahoo Group and be sure to tell your friends! After September 12, the group will close to new members! CLICK HERE TO JOIN BEFORE SEPTEMBER 12! Ah! I wish I could knit better (I wish I LIKED to knit better!). I enjoy watching Joy's progress on her stoles. I loved the Swan one - and know that #4 will be just as lovely! On behalf of the women and children of Genesis Women's Shelter, THANK YOU to Melanie and Georgina Bow for making Genesis your charity of choice! I am available to answer any questions you may have about Genesis and our programs at mlogsdon at genesisshelter dot org. OMG I just peed alittle...I cant wait! I bought Leda's Dream and it's on my todo list for a Christmas present. If the new pattern is as lovely as the earlier one in the Georgina Bow link this should be great. I am currently knitting Leda's dream (which is indeed dreamy) and have ordered my zephyr and beads for this mystery! Looking forward to Sept 5th! There's enough happening that it will pass by quickly enough I hope! I signed up to participate a few days ago for Mystery Stole 4. Yesterday I checked my e-mail and I received over 100 unsolicited e-mails. I don't mind participating, but I don't want to be inundated with e-mails. This morning I checked and there were 12 more unsolicitated e-mails. I will only read e-mails from the moderator, Pink Lemon Twist or her mother unless I solicit the help of someone else. Consideration of others is requested when it comes to e-mail. Snowbird - you need to edit your membership within the MS4 group so that you are set up as Special Notice Only for emails. You didn't leave an email address so I can't contact you personally to help you with this. I edited to receive only from moderator. Much much better. I am wondering what level of knitter should attempt the mystery shawl. I am an intermediate knitter with only a little experience with lace. Will it be too hard for me? Is Shibori on the MS4 Mews Mousepad a tabby-abby?